Every year at the Men’s Basketball Final Four there is the National Association of Basketball Coaches (NABC) Convention. For so many coaches this is the place to be! There are countless gatherings and opportunities to spend time with your peers/colleagues and enjoy all the festivities surrounding one of the biggest events in all of sports. This particular year the Final Four was being held in Tampa, Florida. I was still pretty much a newlywed since my wife, Dayo, and I had not had our 1 year anniversary yet. So we went down to Tampa together and had a great time and she got yet another taste of how all of this college basketball stuff works. At the time we were living in New Jersey and I was an assistant coach at Rutgers University. She was into her first year of residency after having completed medical school at the University of Buffalo. To say she wasn’t fond of New Jersey would be an understatement. Part of it was that she had spent very little time away from her home in Buffalo, NY aside from her days at Cornell as an undergraduate (Honor Student). Part of it was that the majority of her time in New Jersey was spent in the intense and sometimes overwhelming grind of a medical residency program. It also didn’t help that our home in Somerset, NJ was a 40min drive to Summit, NJ where she attended residency at Overlook Hospital…that’s without traffic! Most of the time in New Jersey, there is traffic. Further compounding her distaste for life in New Jersey was the reality of my job as a college basketball coach. I travel a lot, work late and Recruiting forces you to bring work home. So we essentially became two ships passing in the night. She was working so hard that she barely had time to be miserable. But now we were on a mini-vacation at the Final Four and we really did have a good time. It’s cool for me to have her meet so many of the people that I have become friends with over the years as a coach. Today (19 years later) she knows most of my close colleagues but back in 1999, trying to remember all the names and what schools they coached at was tough to grasp. One person I introduced her to in Tampa was Ricky Stokes. Ricky was a renowned player back in the 1980s as a point guard on those terrific Virginia teams that featured the great Ralph Sampson. In 1999 Ricky was an Assistant coach under Rick Barnes at the University of Texas. There was really no reason for me to expect Dayo to remember meeting Ricky among all the people she got introduced to while at the convention. Then a couple of days later after we returned home from Tampa we sat in front the television watching ESPN2 and all of sudden I see Virginia Tech having a press Conference introducing Ricky Stokes as their new head coach. So I tried to jog Dayo’s memory about recently meeting Ricky back in Tampa. She probably humored me some but didn’t really remember. I was really happy to see Ricky getting this kind of opportunity and I was also thinking to myself that I wished I could get involved somehow with that vacant position at Texas because I’d heard Rick Barnes was one of the very best guys in our profession to work for. So I said that to my wife, something like “…man, I sure wish I could get involved at Texas, I heard the head coach there is a great guy to work for…”. She didn’t want to hear anything about me going anywhere. Her residency program required a three year commitment so if I got another job we would be separated for at least a couple of years and she’d be stuck in New Jersey by herself…touchy? No doubt. But it was just a passing comment. No harm no foul. Me: “Ok, we have a function to attend tonight in Manhattan, we will be in the car together and should have time to talk. I look forward to talking later”. She simply turned away and walked back up the stairs and didn’t say a word. She finished getting ready, we got in the car and headed all the way from Somerset, NJ to Manhattan and not a word was said for the entire 1 hour drive. We arrived at the event and put on happy faces. She received her recognition and we seemed to have a nice time. Once the night was over we got back in the car and began the drive back to Somerset. I hand her the phone and she reluctantly takes it. I’m thinking to myself that this cannot go well. First, the forced exchange of a few pleasantries, then she goes quiet, and then all of sudden she starts to giggle. Then she starts saying things on her end of the line like…”yeah, he can do that”… she laughs again…”yeah, that’s what everyone says about him”…laughs again. Then she is just holding the phone listening for a bit…”ok”…”ok”…”it was nice talking to you too”. In all, this was like a 3 to 5 minute conversation where she mostly listened. She hands the phone back to me. Rick Barnes: “We got her, man! We would like to get you on a flight down here as soon as possible. I will make sure we get that set up and get you the details. Talk to you tomorrow”. Within a day or so, I was on a flight to Austin, TX. I’d never been to Austin and really hadn’t heard very much about it. I just assumed it was a small college town with a big University. What a surprise. 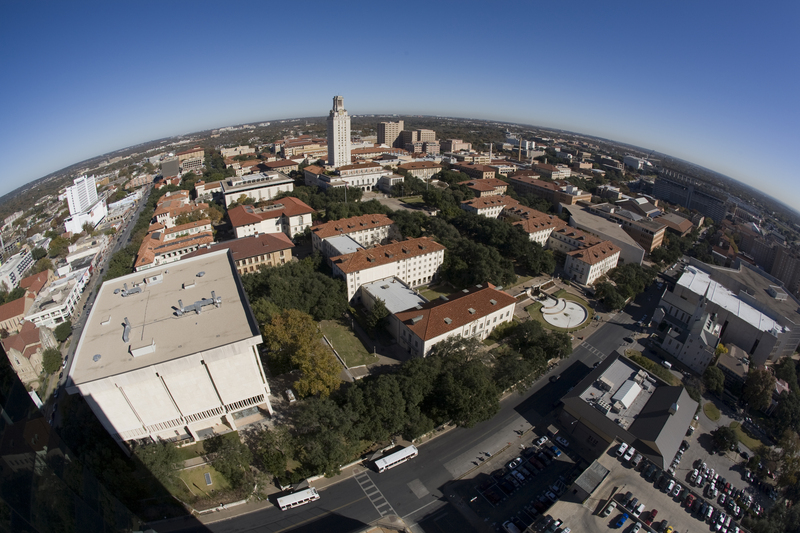 I was so impressed by the city and the campus that I instantly fell in love with the entire aura of the Texas Longhorn situation. The program was strong and the people were great. It was a no brainer. Now, it was very hot and I was wearing a suit because I was still approaching this visit like it was a job interview. It never became an interview. It was more like an official visit where I was the person who Coach wanted and he brought me down to convince me to take the job. I was so excited to tell Dayo about the city, the campus and all the nice things I was seeing but I was also conflicted about that because she would not be joining me right away. So I wanted to be a little careful not to overdo my excitement about leaving her alone 1700 miles away yet I also wanted to share. Dayo made a trip down to visit within a couple of weeks and right away she could see why I was so excited about the city of Austin and the University of Texas. Once Coach had some time around Dayo and got to see her and I together he became fixed on getting her down to Austin. People who know coach know he can really get fixed on something and he wanted to make this happen. So he involved our AD at the time, DeLoss Dodds (Special person) and they began working to find out if there was any way to get Dayo transferred into a residency program in Austin. From my understanding this was a very uncommon practice because Dayo was very pessimistic about the possibility. Within a few weeks, somehow it was done…Hook’Em Horns! My wife had been convinced that making the move to Texas was the best thing for my career (by a stranger) and was willing to make the sacrifice of us being separated in order for that to happen. Not only would we have been apart but she would be in New Jersey by herself with no family. Heavy stuff. Was I being selfish? To this day, I don’t know exactly what coach said to Dayo on the phone during that drive home from Manhattan. I never really asked. Now all of sudden we are going to be together in a place that we were both extremely excited about by the time our 1st anniversary rolls around in June. What a blessing. Two years later on June 9th 2001 our first child, Emory, was born in Austin, TX. Rob Lanier is currently the Associate Head Coach at The University of Tennessee under Rick Barnes. Rob finished his playing career at St Bonaventure University in 1990 and began his career in coaching under Jack Armstrong at Niagara University that summer. In 1992 he moved on to his alma mater under Jim Baron for 5 seasons followed by stints at Rutgers and Texas before being named head coach at Siena College in 2001 where he led the Saints to two postseason appearances (2002 NCAA & 2003 NIT). After Siena Rob worked at Virginia under Dave Leitao (2005-07) and under Billy Donovan (2007-2011) before reuniting with Barnes at Texas in 2011. Great story, Rob! I enjoyed having dinner with you at Poseidon’s Table the other night (with Tina Kent). Best of luck at Tennessee. Go Vols! A great story shared in a very engaging way. I felt like I was there! Great story. I appreciate your honesty and transparency. Wow! Great story! We had a similar experience! Coach Hubby passed me the phone in the car while on our way to a fancy date night. The whole exchange was almost identical to yours. It’s def among our top 5 coaching carousel memories! I am so thankful you took that call from Coach Barnes. Go Vols! 😉 Got a feeling that you will be our next head coach. Hope that happens. I met you once briefly. Can’t wait for the season to begin. Love the character of this team. That actually means more to me (and more fans than you realize) than wins and losses. An endearing story, Coach … someday, will be a treat to meet your better half. She must be very special.